of a solution-based reponse to rural housing need. recognise that the prospect of paying interest on housing loans by families with the lowest per-capita-incomes in New Zealand, is a great obstacle to addressing rural poverty. 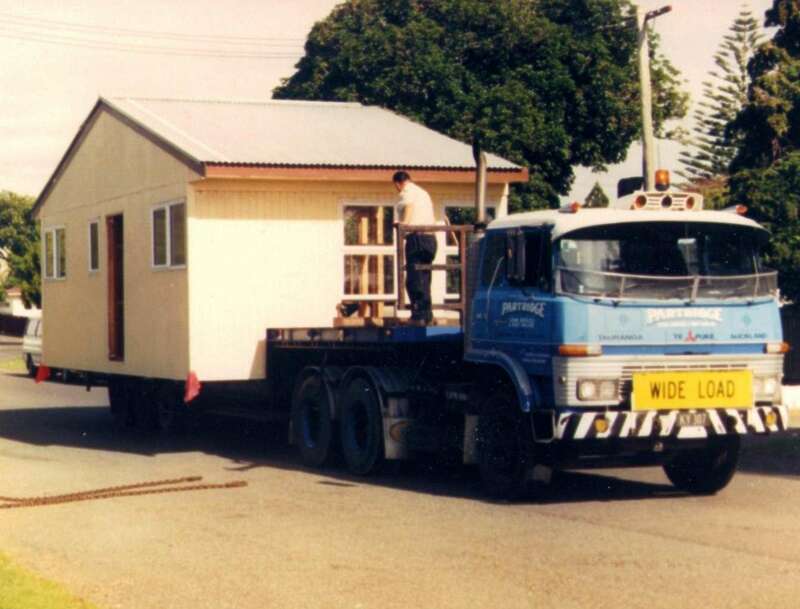 recognise that the solution to rural housing need, lies in a coherent, structural, non-market approach - in the form of a unified, sustainable, and efficient housing delivery system, based on Revolving Building Funds. make the capital investment possible to initiate such Revolving Building Funds, by allowing communities of interest, to capitalise upon the Accommodation Supplement. provide communities of interest with small amounts of capital to build Low-cost Housing Factories , on community-owned land, as the core organisational component of the proposed housing delivery system. seek to use the resources allocated by Government only for the common good. recognise that the needs of children and the elderly have priority. take only those actions which lead in time, to the independence of the housing delivery systems, such that they support the government's need to lower social spending. to use any surplus generated, to generate further economic development and consequent employment in the community. cooperate with other communities of interst, to build an added-value, housing-componentry export market, stemming from this delivery system. Management infrastructure to finance and risk-manage the programme. In a case where the family own their land, a local building administration group would respond by renting their building site from the family and engaging them in the planning of the house. The building site and access to it would be rented from the family for a peppercorn-rent and a contract drawn up detailing the terms and condition of the agreement. A stipulation of the contract would be that all disputes go to arbitration rather than lawyers; that such arbitration is binding upon both parties; and failure to accept this provision terminates the contract and the house is repossessed. The rental monies go into a regional Revolving Building Fund. Low income families renting to the local housing trust would be eligible for a government accommodation subsidy. The regional Revolving Building Fund is necessary to build community capacity at a significant rate. There would be local representation on the regional bodies. The family will take ownership of their house for a sale price of say $1, and upon doing so, the contract with the community ceases, and the family can do whatever they like with the house. Low-cost door and window systems. Plumbing systems adapted for community use. Strategic Planning for this step-equity paper - The Barefoot Builders Campaign. This is the autonomous regional process which triggers off projects in conjunction with local groups. This is the aim of the campaign and of 3rd Economic Sector housing overall - self-financing housing delivery systems. is a process that is no more complex or costly than the present bureaucratic dealings with individual families. is a method which in time will abate the need for the Accommodation Supplement. will counter speculation in the provision of rental housing, on the basis of privatising the Accommodation Supplement. Items a) to g) in 2 above will all be included in the programme. 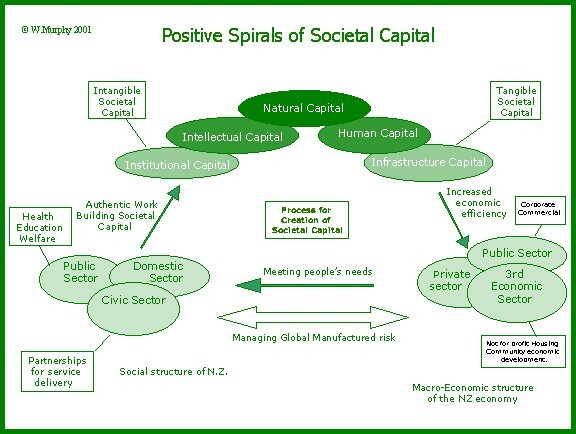 The diagram of the Positive Spirals of Societal Capital helps to define "societal capital". The term, "Societal Capital", recognises the resource-base that lies within the polarised extremes and inefficiencies of both the public and private sectors of the economy. It represents the economic interests of civil society institutions working for the common good. The defining characteristic of the Third Economic Sector's approach to enhancing the common good - as distinct from the public and private sectors - is its egalitarian societal capital = opportunity, social and economic development model. Seeks to modify the excesses of the public and private sectors by offering a genuine alternate. Genuine Societal Capital gives access to all individuals and groups, to understand and engage in Civil Society's social and economic initiatives. The ethical use of Societal Capital can be judged in the extent to which it is harnessed to bring about the empowerment of Civil Society institutions. In a socio/political sense, Societal Capital is that capacity to serve the common good which emerges from respectful partnerships between the Governing bodies and those who consent to be governed. The sectorial overlaps in the lower section of the Positive Spirals of Societal Capital Diagram, represent interacting development paradigms. When the partnership implicit in an interacting paradigm sets aside concept of Rangitiratanga (defence of Mana or natural justice - those who take the responsibility for carrying out a task, have the right to be involved in setting of the agendas) then Public Sector - Civil Society partnerships won't work. The problem facing New Zealand is how to free up sufficient resources to make the necessary investment in building an inclusive knowledge economy. New Zealand is faced with the apparent contradiction of needing to increase its ability to compete in the global market place, meet perceived societal needs at ever higher level of expectation whilst cutting social and other costs. This diagram illustrating spirals of societal capital is presented as a development model which can begin the process of introducing new efficiencies to our economy. The invitation implicit in its presentation, is, in terms of practical judgements, which model of development, the Market model or the Societal Capital model is the most efficient pathway towards an inclusive Knowledge Economy.